Somisetty Landmark is the first class full service hotel representing a unique combination of space and functionality in a contemporary ambience. 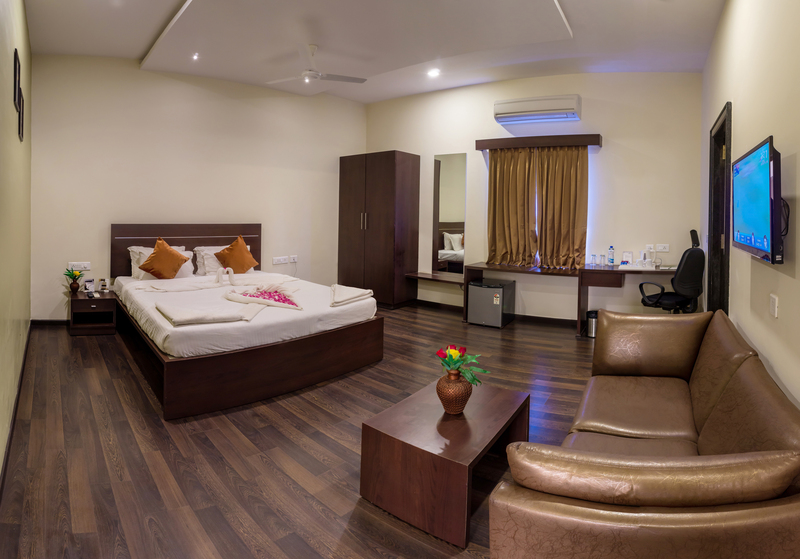 Situated in the heart of Konaseema, the hotel is conveniently located and well connected to the Palakollu railway station, bus station and on the national highway. Offering 41 luxury rooms & suites which are class apart, Somisetty Landmark stands as a grand endeavor and as a landmark for Konaseema. Our inspiration to bring out grandeur hospitality took the name ‘Somisetty Landmark’ which has now become an icon & a monument in Dindi area; the way it is enchanted with our delighted guests & customers. Somisetty Landmark is a subsidiary of ASONALS AG-TECH PVT LTD and is a brainchild of a team that has a proven track record of a successful run in entrepreneurship in different industry segments. Beginning with a humble agricultural background and heading forward for an aggressive march towards their goals, Shri Anjaneyulu Somisetty, the Managing Director and Mr.Srinivas Somisetty, the Joint Managing Director had a vision to build a landmark in the hospitality industry. Today Somisetty Landmark stands tall as a testimony to their vision, with a resounding success to pride them and leaves no stone unturned to ensure optimum quality and precision in adding rank to the service. The hotel has been accorded for its excellence since its inception from its customers and industry experts. We have built our hall of fame in the form of loyal customers. To provide our guests a superior hospitality experience at excellent value in varied market segments. To provide our employees a great work environment, continuous satisfaction and growth opportunities while treating each other with respect and dignity. To recognize that profitability is essential to our future success and therefore provide our property owners and investors the highest possible returns. To focus on our growth and maintain consistency in product through warm, personalized service and absolute transparency in all our dealings. To contribute a part of the returns to the poor & homeless who are in need of food & shelter. To save the mother earth & reduce the effect of carbon footprint by following best practices in operations as a part of Corporate Social Responsibility.